Posted 17th August 2016 & filed under Blog, Intergenerational Justice, Prizes. IF teams up, again, with the Stuttgart-based Foundation for the Rights of Future Generations (FRFG) to award the sixth Demography Prize, open to essayists writing on political and demographic issues pertaining to intergenerational justice. Through this biennial prize, IF and FRFG attempt to raise awareness of intergenerational issues, and elicit new insights into the field. Successful entrants will receive a share of €10,000 in prize-money, generously funded by the Stiftung Apfelbaum. Entries should be between 5,000 and 8,000 words and will be accepted until 1 July 2017. 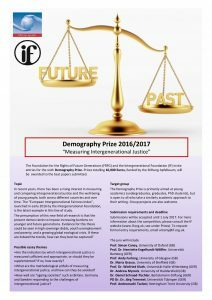 This year, IF and FRFG are calling for papers on: “Measuring Intergenerational Justice”. A growing interest in intergenerational justice has led to a number of attempts to evaluate and compare the position of young people within and across different countries and, crucially, in relation to past generations. Although the various indices differ in the details, their conclusions are broadly similar: that younger and future generations are being disproportionately burdened (for instance, by rising national debt), and are not being given the same opportunities (such as the ability to own homes or hold onto jobs) that were afforded to their parents. Many different angles are welcomed on the topic, from analysis of the current methodology to improvements in chosen indicators and innovative policy approaches to intergenerational justice. Applicants are encouraged to come up with their own essay questions, as long as they pertain to the overall topic. The prize provides an opportunity to share views on a subject which is becoming an increased concern for governments across the globe, and to help inform policy-making on this critical area, in which all generations have a vested interest. For more information on submission requirements, topic ideas and references, please visit the page on the IF website.